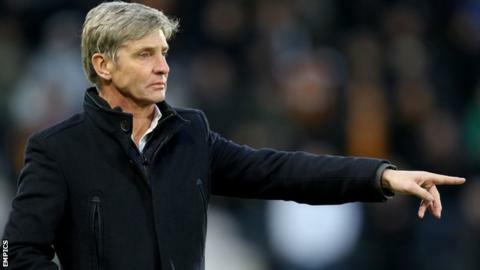 Charlton Athletic head coach Jose Riga has denied his decisions are influenced by Addicks owner Roland Duchatelet. Riga is back at The Valley for a second time under Duchatelet, having kept the club in the Championship during a brief spell in charge in 2014. The 58-year-old Belgian previously had two stints at Standard Liege, whom Duchatelet used to own. "I want my freedom. I am a self-made man and I am alone. I don't even have an agent," Riga said. "He is the boss of the club but I want to be the boss of my dressing room." Since leaving Charlton in summer 2014 Riga has had spells at Blackpool, Standard and French side Metz but he was re-appointed by the Addicks on an 18-month deal last week. Duchatelet has a network of clubs around Europe, including sides in Belgium, Spain, Germany and Hungary, having sold Standard Liege last summer. The Belgian businessman has made five managerial changes since taking over Charlton in January 2014, and Riga's predecessors Guy Luzon and Karel Fraeye both have links to Duchatelet. "A lot of people think I am part of the network but I am not at all, because I went to other places," Riga added. "For me it is a professional relationship between an owner and a coach - not more." Riga guided Charlton to survival in 2013-14, winning seven of his 16 games in charge of the south-east London club. Having begun his second spell with a 6-0 defeat at Hull, the Addicks are currently 23rd in the table, four points from safety, and Riga says the task in front of him represents a bigger challenge than the one which he faced two years ago. "I'd like to think that it is more difficult and I will put in more energy than the first time," he said. "It is a tough situation with a lot of things to do. It is up to me to find the right solution and show everybody the right direction."